This article is about the train operating company operated from April 2016. For previous franchise operator, see First TransPennine Express. TransPennine Express (legally known as First TransPennine Express Limited)  is a British train operating company owned by FirstGroup operating the TransPennine Express franchise. It runs regular express regional railway services between the major cities of Northern England as well as Scotland. The franchise operates all its services to and through Manchester covering three main routes. The service provides rail links for major towns and cities such as Edinburgh, Glasgow, Liverpool, Sheffield, Hull, Leeds, York, Scarborough, Middlesbrough and Newcastle. TransPennine Express is one of the few UK train operating companies running 24 hours a day, including through New Year's Eve night. Trains run between York, Leeds and Manchester Airport at least every three hours every night of the week. The TransPennine Express brand was launched in the early 1990s by British Rail's Regional Railways sector. It became part of Regional Railways North East and on 2 March 1997 was privatised with Northern Spirit and its successor, Arriva Trains Northern maintaining the brand. 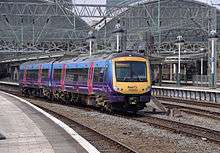 In July 2003, the TransPennine franchise was awarded to a joint venture between FirstGroup and Keolis, and the services operated by Arriva Trains Northern and First North Western were transferred to First TransPennine Express on 1 February 2004. On 11 November 2007, the services from Manchester to Edinburgh and Glasgow via the West Coast Main Line formerly operated by Virgin CrossCountry were transferred to First TransPennine Express. In August 2014, the Department for Transport announced FirstGroup, Keolis/Go-Ahead and Stagecoach had been shortlisted to bid for the next franchise. In December 2015, FirstGroup was awarded the franchise with TransPennine Express taking over on 1 April 2016. The franchise will run until 31 March 2023 with an option to extend for two years. As part of a recasting of the franchise map by the Department for Transport, services from Manchester Airport to Blackpool North, Manchester Airport to Barrow in Furness and Oxenholme to Windermere were transferred to the Northern franchise on 1 April 2016. TransPennine North West, which consists of services on the West Coast Main Line. Trains reverse at Manchester Piccadilly. Sunday service reduced to 1 train every 2 hours. Oxenholme Lake District, Penrith and Lockerbie are generally served hourly but there are two-hour gaps between some services. A twice-hourly service between Manchester and Newcastle will be phased in between December 2016 and December 2017, made up of the existing service from Liverpool and a reinstated service from Manchester Airport. Trains between Liverpool and Newcastle will be extended to Edinburgh via the East Coast Main Line, giving a twice-hourly service between Leeds and Edinburgh together with an hourly CrossCountry service. Trains between Liverpool and Scarborough will be rerouted via Manchester Victoria and Newton-le-Willows to provide a half-hourly fast service between Liverpool and Manchester. It is also planned to operate a six train per hour frequency between Manchester and Leeds, up from five today. Direct Liverpool to Glasgow services via the West Coast Main Line will be reintroduced from December 2018, and the number of services from Manchester Airport to Scotland will increase. TransPennine Express inherited a fleet of 51 three-car Class 185 Desiros, 10 four-car electric Class 350 Desiros, and four two-car Class 170 Turbostars from First TransPennine Express. After 8 July 2016, the four remaining Class 170 left for Chiltern Railways to be converted to Class 168 sets. Once new rolling stock is delivered, 22 of the Class 185 units will be returned to Eversholt Rail Group with 29 units (87 vehicles) retained. A total of 44 brand new five-car trains will be delivered to TransPennine Express. TransPennine Express services run over a large area of northern England and southern Scotland. Many of the largest stations they serve are managed by other train operating companies or Network Rail. Some stations from the former First TransPennine Express franchise were transferred to Northern. These include Arnside, Barrow-in-Furness, Birchwood, Burneside, Carnforth, Grange-over-Sands, Kendal, Staveley, Ulverston, Warrington Central and Windermere. Siemens maintains the Class 185 and 350 fleets at Ardwick depot in Manchester with a smaller facility in York. Hitachi will maintain the AT300 fleet at Doncaster Carr and Craigentinny. The new EMUs and loco-hauled sets will be maintained by Alstom, on behalf of TransPennine Express, at Longsight (Manchester), Edge Hill (Liverpool) and Polmadie (Glasgow). ↑ The Trans-Pennine Express rail franchise Archived 20 October 2004 at the Wayback Machine.. Yorkshire & The Humber Transport Activist's Roundtable Briefing Note October 2001. ↑ "SRA Announce Preferred Bidder For TransPennine Express Franchise" (PDF) (Press release). Strategic Rail Authority. 28 July 2003. Archived from the original (PDF) on 28 July 2003. ↑ "FirstGroup awarded TransPennine Express franchise". Rail Technology Magazine. 9 December 2015. Retrieved 9 December 2015. ↑ "Arriva and First chosen for Northern and TransPennine franchises". International Railway Journal. 9 December 2015. Retrieved 9 December 2015. ↑ "FirstGroup plc welcomes award of TransPennine Express rail franchise". 9 December 2015. Retrieved 9 February 2016. 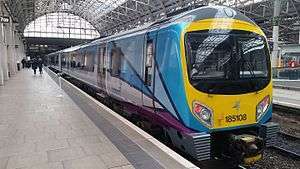 ↑ "New TransPennine Express franchise launches - First TransPennine Express". First TransPennine Express Trains. Retrieved 2016-04-02. ↑ "TPE New franchise presentation for TfGM". ↑ "Class 68 Specification". Rail Magazine. October 2014. 1 2 3 "More new trains for the North and Scotland". First Transpennine Express. 20 May 2016. ↑ Haigh, Philip. "Is it time for the railway to standardise on fewer types of trains, to cut costs?". PressReader.com. Rail Magazine. Retrieved 23 July 2016. ↑ "Safe and sound train stations". First Transpennine Express. October 2011.